IBEW Local 1245 has nearly 20,000 members providing valuable services to their communities at over 200 employers and contractors. See some of their work here. You can find more member photos in our Photo Gallery. The Weakley Hall office staff from left: Scott Kollman, dispatch; Shawn Canaday, dispatch; Sonja Simmons-Scott, legal secretary; Peggy Proschold, print room; Muriel Moore, PRD clerk; Caitlin Ramirez, front counter; Nancy Kendrick, dispatch; Gail Varner, bookkeeper; Jennifer Edwards, new member desk; Marsha Sims, librarian; Gina Britt, dispatch; Tonya Alston, office manager; Karen Kiley, executive secretary; and (inset) Erik Rodriguez, working dues. Sean O’Neil, City of Lompoc Senior Tree Trimmer, clears branches away from a power line. 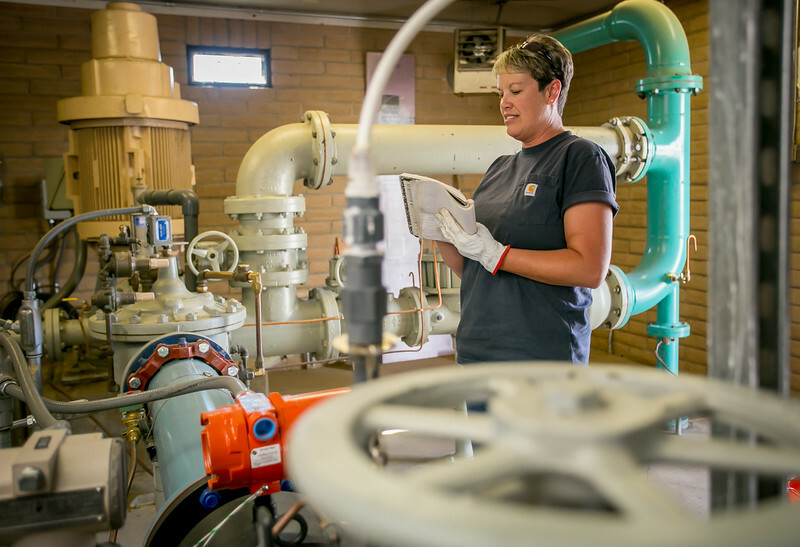 Robert O’Brien, City of Lompoc Lead Water Maintenance Tech, monitors the quality of Lompoc’s water. Davey Tree crews in Martinez gather for a Close Call presentation. Gus Vargas,City of Lompoc Heavy Equipment Mechanic, performs a safety inspection on a fire truck. Davey Tree crews in Oakland gather for a Close Call presentation. Scott Long, City of Lompoc Senior Sanitation Engineer, dumps refuse at the landfill.